Battlefield 3 (BF3) is a game that needs little introduction; developed by Digital Illusions CE (DICE) and published by Electronic Arts (EA), it is one of the most hyped and highly anticipated games released in 2011. Many fans of the series were hoping for an updated recreation of the critically acclaimed games Battlefield 1942 (2002) and Battlefield 2 (2005), or at least a combination of Battlefield 2 with the more recent Battlefield: Bad Company 2 (2010) to take advantage of its graphics and destruction engine. Today we will take a look at how well the PC version of the game held up to its high expectations after the months/years of anticipation and numerous trailers that were published prior to the release on October 25th, 2011. For those that are reading this article whose last Battlefield game was Battlefield 2, yes, there is a Campaign in your Battlefield game that is not just creating a local server with X-number of bots to mow down when you are bored. While a full-priced game may be able to get away without having a story/campaign in 2002 and 2005, in 2011 it has become standard so DICE has done their best to include one in the third installment of the series. For others who have played through the Bad Company series (1 and 2) you may expect a light-hearted squad of caricatures to help save the world; however, BF3 comes at their single player from a far more serious angle with almost no intentionally funny parts. The story is full of cliche moments taken from Call of Duty games, but with small twists. A lot of this section will be made in comparison to Bad Company 2 – the most recent Battlefield game with a storyline. The combat (and destruction!) is visibly scripted and linear. There are no longer times where you take out a wall for a different way to attack or to flank an enemy–it is all about moving from waypoint A to B to C to start the next scripted sequence, which becomes noticeable when you find the old ‘Monster Closet’ where enemies keep spawning until you do something to stop it (i.e. reach a certain blue waypoint on the ground). At these waypoints you will either be shooting bad guys to get to the next waypoint or defending a point until the enemies stop running at you. Which brings me to a point about the AI in the game: The enemy AI is pretty awful. They refill the same “hiding” spots over and over until they run out of respawns. Their ‘hiding behind cover’ is like watching a 1-year-old play peek-a-boo with their hands in front of their faces. 99% of the time they are crouched with half of their bodies in plain sight, if not just crouched in the open facing away from me. The friendly AI is not much better. Fortunately they cannot die during combat (unless you are tasked to protect them as part of a mission), so they can absorb the few shots that are not aimed at you. But for marines their combat skills were quite lacking – they may as well have been using BB guns for all of the damage that they did to the enemies. I am honestly not sure that if it would have ever finished a section without me killing virtually every one of the enemies had I let the game just play (read: let the AI shoot at the enemies) . My squadmates also had a fun tendency to run through my stream of bullets causing me to fail a mission because of friendly fire. The forced nature really shows up by punishing you for trying to move ahead/lead your squad — if you do anything too fast you die instantly (I died twice before getting the rocket shot off to kill the sniper in Fault Line mission). Another example is a moment right before the last mission, I kept dying because I did not click at the exact right time. It took 2-3 times until I fully understood what it wanted and then another to learn when it wanted me to shoot. To add insult to injury, when I failed I had to listen through the same cutscene each time. Throughout the linear level design the player will be forced to complete relatively simple quick-time-events (QTEs) that make you to press a button that appears on the screen in order to complete the action/activity. If you were one of the millions who watched the trailers that were released you will have seen quite a few cinematic sequences (one of which is pulling a friendly to safety after he was shot, another a hand-to-hand fight sequence); most of these turned out to be QTEs that take you out of the feeling that you are the character. In my opinion, QTEs did not enhance overall gameplay. Instead of needing to repeatedly hit spacebar to hold onto a ledge or “E” then “Left Click” to complete a 10 second fight sequence, I would have preferred if it had either been a cutscene or a more intricate sequence where the typical game controls were used. Below is an example of a QTE gameplay event, and an example of what happens if you fail to hit the correct button (you die immediately). Unfortunately the gameplay and storyline of the campaign is just not up to snuff with many of the other first person shooters of this generation, including its cousin Bad Company 2. The story is weak and any emotion feels forced on the player: find nukes, find who they belong to, stop nukes while jumping behind the rifle of multiple loosely related characters; each segment separated by a cutscene. I never felt any attachment to the characters like I did in BC2, probably because they had no real personality or specialties of note. It really felt as if they were trying to take some of the cool moments out of the Call of Duty series instead of doing their own thing well (which outright, is multiplayer and vehicle combat – of which there was surprisingly very little). On the bright side of all of this negativity, the graphics, sound, and the destruction [albeit mostly scripted] is all quite beautiful and it really does the Frostbite 2 engine some justice, but all of those positives are also better represented in the multiplayer portion of the game. In closing on the single player, DICE would have been better served to just allow people to create a local server or a training map where they can join and learn how to fly/drive the vehicles and become familiar with the maps against bots (ala BF2). Long Story Short: Don’t bother with the campaign, unless you have nothing else to do. When I finished the 6-8 hour story I did not feel relief, achievement, or accomplishment, I just sat there and went “that’s it?”. Time for the main event! The Battlefield series is well known for its ability to create an extensive war zone that scales everywhere from infantry to tanks, helicopters, jets, jeeps, and boats – and this installment does not disappoint in those areas. The game ships with 9 total maps and a handful of different gameplay modes: Conquest (similar to king of the hill), Rush (attack/defend objectives), Team Deathmatch, and Squad-versions of Rush and Deathmatch (teams of 4 players compete against other 4-person teams). Each of the 9 maps has a layout for each of the gametypes, giving many options to the players with promise of more maps being released as Downloadable Content in the near future. The first DLC, Back to Karkand, will bring back four of the most popular maps from Battlefield 2 as well as a gametype (Conquest Assault) and unlockable weapons. Back to Karkand will be free to those with the ‘Limited Edition’ of the game (read: pre-ordered the game from a reseller) — to everyone else, it will retail for $15. The maps can support a variety of player numbers scaling up to 32 vs 32 battles. One big issue at this point is the majority of the maps feel too small for 64 players. In my opinion the largest player count for most of them should be around 32, otherwise you end up with people simply shooting rocket launchers, grenade launchers, mortars, and tossing grenades into chokepoints with no/little chance of either team progressing; 64-person Metro-Conquest is a perfect example of this mayhem. Taking this into consideration, the map sizes feel like PC players got the same maps that the console players use (with an appropriate number of players) and then simply were given the option to add more people, thus causing more chaos without more room to spread out. With these issues I recommend sticking to 32-player (or smaller) servers to be able to get a feel for the maps and battles. In Battlefield 3, I have not run into the issues that the example video shows. The only problem I have had is the occasional lag in damage detection where I just make it around cover and end up taking enough damage to die, most likely because of a ping differential between myself, the server, and the opponent. One of the biggest complaints with Bad Company 2 was the unlockable system (for getting new weapons, attachments, gadgets, etc for each of the classes) and how players had unlocked everything possible by the time they were halfway through the maximum 50 ranks. DICE answered the call of the fans by greatly increasing the number of unlocks by making them specific to each weapon, class, and vehicle type. It may seem like somewhat of an artificial game-lengthener (and it is), but it will keep you interested in maxing out the different weapons and vehicles as you continue to level up. The flying, driving, and running around all feel fluid and purposeful. There is something for everyone at different skill levels — a player is never forced to drive tanks or fly around unless they want to (check my tips at the end of this section!). In contrast to the single player, the destruction works relatively well and looks beautiful as expected from the upgraded Frostbite 2 engine. You can pretty easily blow up certain walls/buildings with the right amount of C4, Rocket launcher shots, tanks artillery rounds, etc. I have found that there is significantly less destruction than what there was in BC2 (few buildings will fully collapse, but walls can be taken out). This is most likely because of computational limitations on the consoles, as well as possible map balance issues that were seen in BC2 due to having an entirely flattened city. The multiplayer is fantastic overall – when it works – and only gets better when you are playing with friends and when you have a good team. I have had a few non-gameplay issues that others have also encountered and posted about in our Official Battlefield 3 Thread (launch-day posts start around post #2850). The biggest problem was the occasional crash of the game, which happened most often during the loading of a map. The game would freeze, and upon alt+tabbing the user will see that the Battlefield3 executable has stopped responding and must be closed. [Note: During the first week of release I received this error quite a bit; I have since rebuilt my operating system (the week after launch) onto a solid state drive and the quantity of these errors decreased dramatically. Since then I have quadrupled my playtime from 8 to 32 hours and have only had a handful of crashes, compared to about a third of the time when loading the game or changing maps prior to the rebuild — although this could just be a coincidence]. Another issue that could be fixed via a few patches is that changing accessories for weapons takes too many clicks to setup, especially since it can only be done on the deployment screen after death. The only other quibbles of mine are that the chat box needs to be easier to read and the minimap deployment screen needs to be more descriptive (in larger maps/games with several spawn locations, it can be difficult to figure out exactly you will be spawning). I recommend that newer players unaccustomed to the vehicles search the server browser for a near-empty 1-person start server where to practice driving land vehicles and flying jets and helicopters. It is beneficial to get the hang of handling these vehicles before joining a largely populated server and trying to fly with a team that is dependent on you to get from A->B without crashing. 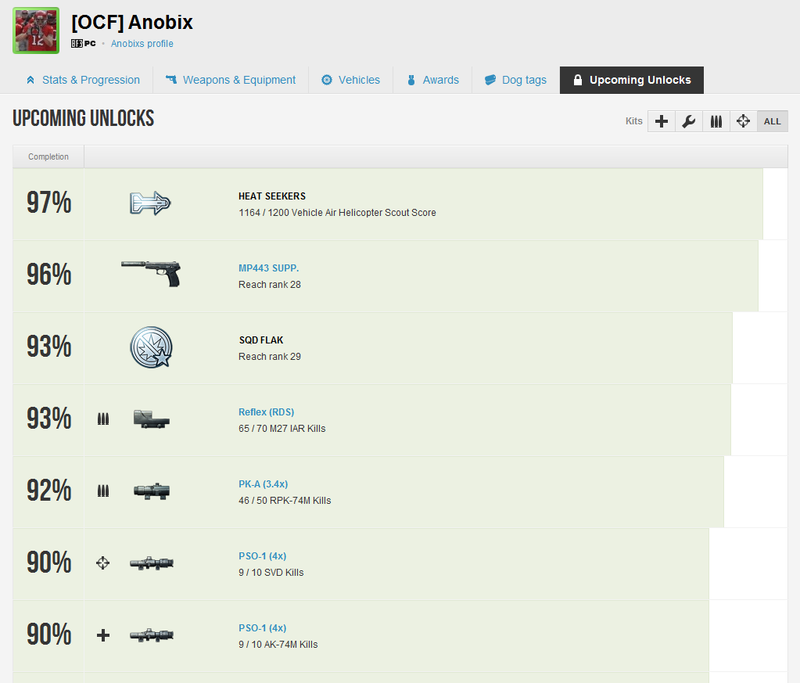 One of the most debated additions to the Battlefield franchise is not even seen inside of the game: the Battlelog. The decision by DICE/EA to move everything non-gameplay to a web browser could have ended up being a huge mistake or just as big of a success. 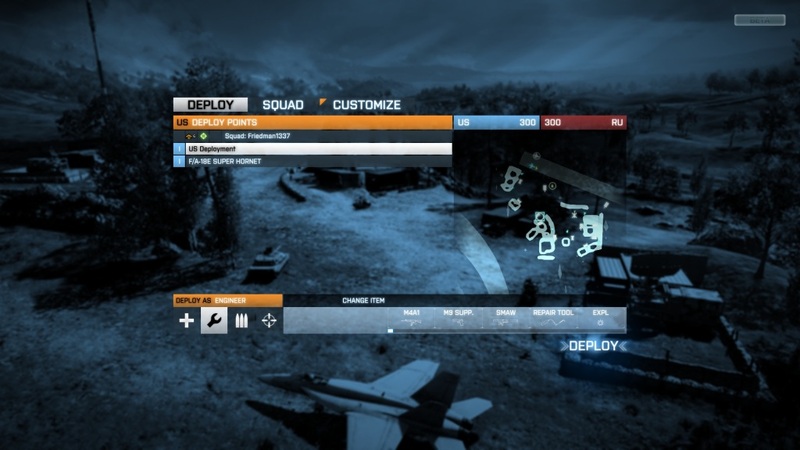 Taking the risk of forcing PC players to use a web-based system to look at their stats, manage their friends, and join games has mostly paid off for BF3. The soldier stat collection is updated after every round and you are able to see your current unlocks and those that are coming up for each of your weapons and vehicles. The friend system works quite well, although it could have been improved if it had imported automatically from Origin’s friends list (EA’s version of Valve’s Steam). 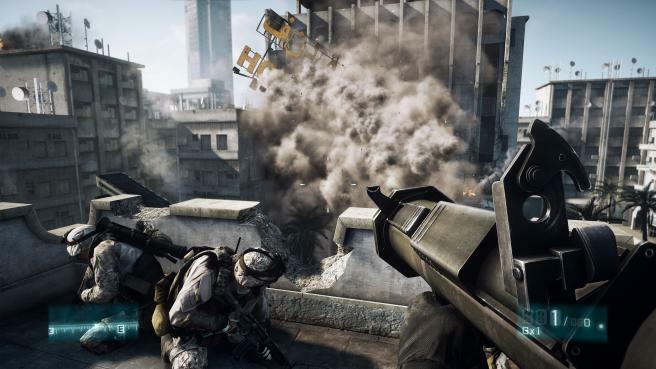 Overall, Battlefield 3 is a good solid game, but there are some definite places left for improvement. The single player would have been more successful if the player could just create a local server against bots as you could in Battlefield 1942, 2, and 2142. If we ignore the campaign and strictly focus on the multiplayer the game is excellent, there are times when unique situations happen that have become tagged as ‘Battlefield Moments’ such as the video below. The ability to eject from your about-to-explode jet, pull your parachute, lock onto the enemy aircraft, and then send a rocket at it for a kill just does not happen in any other game. It is memorable moments like these that keep you playing and bring you back for more. While there are some map-size and occasional balance issues with the multiplayer, most of them can be avoided by using the convenient filter system that is located in Battlelog. Being able to simultaneously see and compare your stats against other players, chat with your friends, create and view platoons (clans), and see all of the unlockable content of the game from any internet browser is an excellent addition to this franchise and will likely be the benchmark used by games to come. The graphics in the game are beautiful even on the lowest detail settings, allowing players with lesser systems to get into the game (although it would be recommended to stick to servers with smaller player numbers if your system is on the lower end of the system specifications). The game is filled with things to do for hundreds of hours worth of unlocks, leveling up, and playing with your friends. 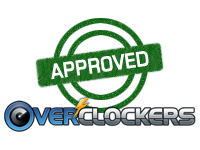 Despite the much-to-be-desired single player campaign, it is overshadowed by the combination of the game’s excellent multiplayer and the rest of the games features; therefore I am honored to give Battlefield 3 the Overclockers.com Stamp of Approval. Editor’s note: Now that you’ve seen how the game plays, head on over to the second article of the day and find out how it performs! I hope you guys like it! Let me know what you all think! IIRC, this is the first game review since we've moved to the new frontpage over two years (I think) ago now. Excellent review Janus! If enough people like the writing (and feel that it fits) I would be happy to write more game reviews, although I'm not an expert in every game/genre I feel I can give a game a fair shake after doing a bit of research. Thanks again for your help Hokie! I've seen a lot of people complaining about too many people. I just don't get that. On those big maps with 5 flags 64 players feel like a bare minimum. With 32 players the whole thing becomes silly, with people constantly running circles around each other grabbing flags behind each others backs. My reasoning is that there were (arguably) only a couple maps that were big enough to hold 64 players. If they want that many players to fit onto a map they should have more than 4-5 flags - just think that means to win (by controlling 3/5 flags in order to make the opponent's tickets go down automatically) you can have 10-11 people at each flag defending (assuming you have a team of people working together and not almost everyone running around like chickens with their heads cut off). And rush is near-impossible to play as an attacker with 64 players, and 32 can be difficult enough when you only have to defend two points. Great review indeed. The visual aids from previous BF games were a great addition. Nope, I had a great time playing with you Miah! The stupid rubberbanding is limiting my playtime, but if I see you online tonight I'll hop on with you guys! Well, I agree that 64 player rush is insane. The two problems are that the numbers of vehicles don't increase from from 32 so the attacker can't bring enough firepower to bear, and the coordination problem where you need to get enough of the 32 players on the attacking team to attack at once. But 32 players in rush is barely enough. And that is even after one of the mcom stations have been blown up where you have 16 vs 16 on one point. But with 5 flags and both teams attacking and defending you generally end up with simply with squad on squad battles at the flags most of the time. Now, true, there are some maps that don't scale to 64 players, like Metro or Seine Crossing.